I'm Jacob Sawade, and I have cerebral palsy. I have lived in the small town of Tehachapi, CA for most of my life. I have an adventurous spirit, but have been stuck in wheelchairs my whole life that do not allow me the freedom to go where I Dream of. I often get stuck in places on sandy roads or in a hole and am forced to call friends and family for help – while I love their support, I am raising money for something that would allow me to be more independent and go out and explore the world. With all of Tehachapi's dirt roads and often incomplete sidewalks that I have trouble with every day of my life, I really need an offroad chair that will take me to places I have only Dreamt about and would help me get around town. On August 9, 2018, I got the opportunity to take a TEST ride on an Action Trackchair. A close friend of mine and I spent months of research trying to figure out what my needs were. We finally found a chair that will both help me with everyday tasks and take me out into the world, but also I have never been on the beach or through snow or sandy spots without having to be carried. This chair will allow me to do these things on my own. 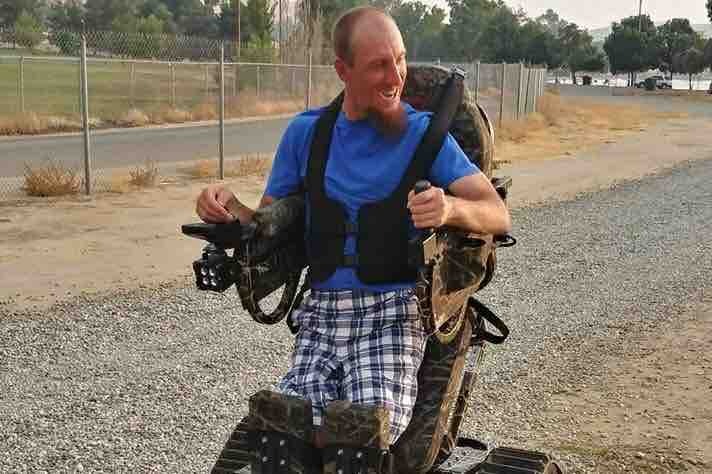 When I test rode the Action Trackchair, I also had the experience of standing up proudly for the first time in my life. I could look my family and friends in the eyes without straining my neck. This chair can be fit with options that will match my needs, and much more. I hate to be stuck at home when my friends are out exploring the world, and wish I could join them. Please help fund my dream to experience life off-pavement. Insurance would never cover this kind of expense, let alone a chair fully adapted to my needs, so it is with your donations that my dreams can become reality. Thank you for your support. I will try to keep everyone updated on my progress as fast as the universe will allow me. Donations can also be made at any Bank of the Sierra location to the Account # 2201556105 Routing # 121137027 or tell the bank it is for Jacob Sawade's account / Jake's Wheelchair Fund. I am so Thankful for everyone's support. I have reached$19,300 of my $25,000 goal and will be ordering my Trackchair soon. I am still trying to raise funds for an electric lift to transport the Trackchair with my vehicle to locations out of town. I need around $4,000 to $5,000 more to achieve this. Thanks for everyone's help. Thanks for everyone's support I have raised $9,000 of my goal in 48 days by the help of 75 donations. I just wanted to keep everyone updated on my dream. If anyone knows a business around Tehachapi that the owner would allow me to place a donation box at plz let me know it would help. I have already been to half the town . no corporate place will allow me. I have boxes made already. I'm so Thankful for all the support. It has almost been 1 month since I shared my dream and I am almost 1/2 way there. Please continue to share my dream and help reach my goal. Wow! I am so Thankful for the $5,000 Anonymous donation to my dream it has left me speechless. I reciecved an amazing donation to my dream yesterday and have reached $8,200 of my goal $25,000 goal. Thank You so much for your help to who ever it was I really love the support.